This is the second in a series of interviews with each of our Tidig karriär Konferens Award (ECCA) winners for 2018. In these blog posts our winners will tell us more about why they applied for the award, and what they are looking forward to at the conference. The ECCA winners are sponsored by SLA Europe and SLA Divisions, and will be attending the 2018 SLA Konferens & INFO-EXPO in Baltimore this June. Our second interview is with Eleanor Matthewson. 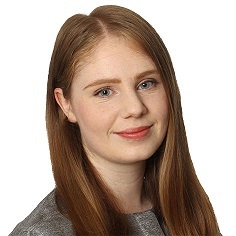 Eleanor is a Legal and Business Research Officer at global law firm HFW. She has responsibility for the firm’s global information training programme, which includes organising and delivering training sessions and the creation and development of the library’s online training and guidance modules and documentation. Eleanor completed her MA at UCL before joining HFW in 2016 and has previously worked at Norton Rose Fulbright and Central Saint Martin’s. Her award is co-sponsored by the Legal Division. Why did you pursue a LIS career? While studying for my undergraduate degree I found that I was good at tracking down information and enjoyed research. I also did some volunteering in libraries and museums which I really enjoyed. After graduating I decided to seek out a Graduate Traineeship in order to get some more experience in this area. I found that my skills and strengths matched up well with key information skills, exempelvis, problem solving skills, attention to detail and communication skills. My first LIS role was as a Graduate Trainee at Norton Rose Fulbright, a Law firm. This was a very new experience for me, as I had no experience of Legal information, or providing library services in this context, but I found that I really liked working in this environment. After completing this year I went on to UCL to study for an MA in Library and Information Studies, and worked part time in the library at Central Saint Martins. After completing my MA, I decided to seek a role in the legal information sector. I made this decision as I had really enjoyed my previous experiences, and wished to take on a post qualification role in a similar environment. I am now a Legal and Business Research Officer at HFW, a global law firm. In my role I contribute to the library enquiry and research service, the provision of current awareness and am responsible for providing and coordinating training on resources and research skills. Why did you decide to apply for an ECCA with the legal division? I had heard about the award from a number of past winners- all of them had found it an incredibly rewarding experience which encouraged me to apply. I decided to apply because attending the SLA conference would allow me to develop my professional knowledge and skills through the huge range of sessions and speakers. The ECCA also provides a great opportunity to help expand my network of contacts, and also to continue my involvement with the SLA beyond the conference. I know that there is a strong track record of ECCA winners becoming involved in committees and boards and this is something that I would like to continue. What are you most looking forward to about SLA 2018? The international nature of the conference is exciting- I am keen to learn more about the international library and information landscape, and make connections. I am also looking forward to the opportunity to encounter new resources and suppliers through the INFO-EXPO. I am also looking forward to visiting Baltimore- it looks like a great city and I hope that I get a chance to explore it. I will be spending a few days in New York after the conference as well to make the most out of the experience! Which sessions/speakers on the programme are excited most about? There are a lot of interesting sessions- it is definitely going to be a struggle to choose! I am looking forward to the Legal Division Knowledge Cafe: AI and the Law Library or “Will I be replaced by a robot?” This is a hot topic in law at the moment so it will be an interesting session. Another hot topic is blockchain, so I am also planning to attend the session on that. It will also be interesting to hear about the Maryland State Law Library.